I posted about the Inquisitor Lok model I'm working the other day. This is a bit of a follow up to that post. Inquisitor Lok is part of a larger commission I'm working on (it includes the Raven Guard scouts and the Deathwatch Drop pod projects). He came to me still in the little plastic FW bag. I knew he would come like that. I also knew he'd need some work to get him up to speed. Stuff from Forge World almost always needs some additional work before painting, I knew this too. When I opened him up to start working on him, there was a little more than usual that needed to be done with this guy. No big deal, no extra charge to my client, no huge delay in the timeline, just a slightly worse off cast than usual for a Forge World model. And then I came to the power sword in his right hand. At first glance, I thought I wouldn't be able to fix it. Then I figured I would give it a go and be real careful with it. Anyone see where this is going yet? The first two attempts got some (read suprisingly very little) of the bend out of it. On the third pass, the sword broke. Now let me stop right here. I've worked with FW stuff before and I have a good understanding about bending warped bits back into shape. I've had great success doing it before according the the directions Forge World puts up on their site. If you follow those directions, it works. Still, I was amazed when the power sword snapped. 1. Try and repair the sword. No good, you can tell the damage has been done. 2. Tell my client he's out of luck. Not even an option. He gave me the job, if he wanted to do it himself, he would have kept the model. 3. Attempt a conversion with my client's permission. There are other swords out there that can be used. The question is, will my client go for it since it will change the look of the finished model slightly. 4. Buy the same model myself and replace the sword bit for my client. This is an option if need be. I would much rather my client be happy with his model since I know that he'll come back knowing I will fix any problems that arise when working on his stuff. 5. Contact Forge World, exlpain the situation and see if they will send me a new power sowrd. This too is an option. Perhaps FW will replace it knowing that the cost of the power sword bit and the good customer service will pay back dividends in the long run. Send Forge World an email asking if they will replace the bit first. If that doesn't work, my client has approved a conversion with another power sword. So I sent this email to Forge World on the 10th of December. I am writing in hopes that you will be able to help me with a problem I have concerning the Inquisitor Lok model. I do commission work for a number of people and have recently started an Inquisitor Lok model for a client of mine. He ordered the model from you guys and then he shipped it to me on his own. When I received the model' it appeared to be in good shape and had the "common" problems associated with resin. There were a few areas that had bubbles, some areas that did not fill completely and a few mould lines. These were easily taken care of with a little greenstuff and some delicate sanding. The one problem I did have was the servere warp in his sword. All of the other bits were fine and showed no warping at all, only his sword. I attempted to try and fix it according to the directions on the Forge World website. This process has worked for me before with a number of other Forge World models with great success. Unfortunately, that would not be the case this time. After numerous attempts to very carefully straighten out the sword, it only kept warping back. It was then that the blade broke from the hilt. I hope that you can help me with this and send me a new sword to replace the severely warped one that is now broken. I do not need any other bits for the model as the rest of them arrived in useable condition. Thank you for your help with this. I understand it is the holiday season and you all are busy this time of year. I look forward to hearing from you and keep up the great work, the level of detail on Forge World models is absolutely stunning. As of today, I haven't heard back from Forge World yet. Not even a standard form email saying they don't do this and I'm out of luck. I've decided to start work on the Inquisitor's skull servitor for the time being in hopes that Forge World replies to my email and I can plan according for my client. My friend has already approved a conversion for the power sword if need be. I guess I just hoped for a little more from Forge World. UPDATE: Here's Forge World's eventual reply. I agree, call them. I've never had a response to email, and it wasn't xmas when I sent mine either! I too have had a sword snap.. they're just too thin. My client ordered two sets of DA FW door for the LR, both were warped in exactly the same way, would have thought FW quality control would sort the moulds out better.. other than these doors I've never had a problem with FW stuff. Call them and they'd be more than hwappy to help. Though they may have to send the bit to the cusatomer first. Hell they cant spell my home town right. If there anything like GW, don't bother emailing, you have to call them. It takes GW a week to a month respond to emails. Aye, calling works, email does'nt. It's widely know that FW never answers email, the only way to get replacement parts it to call them, then they're very, very good about replacements. Once again, I have to agree with the rest, an email doesn't work, a Call is the only way. The only other thing to do, and this does not work anymore, was to take it up to the Bunker in Glen Burnie and swap the model out for a new one. But since the Bunker does not carry Forgeworld stuff anymore it is a no go now. A call will most definitely work. Forgeworld pride themselves extremely in customer service. They will be happy to help you out! My understanding is that they're terrible about their e-mail account. I've had a couple of problems that I've called about and BAM they've taken care of it immediately. Their customer service is amazing... just only by phone. 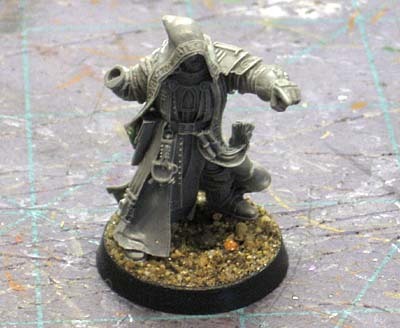 I'm in Aus and ordered Inquisitor Hector Rex quite some time ago. He arrived and he was in quite good condition. save a bit of sword warpage I couldnt save (as above). I didnt worry about it - but then months later I had antoher charge from Forgeworld on my card. With no idea what was happening I emailed them asking whats going on... no response to date. A week or two afterwards, i recieved a package - Inquisitor Hector Rex. Now I have two! though the sword is warped even worse in the second model. And despite a few additional emails to forgeworld about can i have my money back and they can organise the pickup of thier mini, ive had no response. really disappointing service from them. I've worked in customer serice for 7 years, it's really beyond ridiculous they cant get thier act together. Call them mate, I've done it a few times and they've always sent out replacement parts. I wouldn't expect any replacement sword they send you to be in much better state than the original anyway. Every FW powersword I have ever received (3 DKoK and 1 cadian) have looked more like wafer thin pigs tails than swords. I guess it's an issue with the contraction of the resin as a part so thin sets. As the guys before say, give them a call and make clear what the problem with the part was in the hope they can send a replacement in better condition. That's a shame, Ron. The power sword on my Lok model has hardly any warping, something I hope will be easy to fix using the advice on the FW site. But if e-mail response isn't forthcoming I'd recommend calling them. Call them. They almost will not respond to email ever. If you give them a ring though, their customer service is top notch. They run a customer service skeleton crew and email is the worst way to get their attention. And here I thought email would work creating a paper trail for people to follow. I figured a phone clal was the worst idea since anyone could answer the phone and who knows if it would be followed up. Looks like I may have to try calling this week. But if the replacement is no better than the original... I'm no better off. I also have had problems with warped peices from the Renegade Assault pack, some of the autoguns were so badly warped and missing tips. I phoned them up and gave my order info and they sent out a whole new replacement pack within a space of 2 weeks. keep calling until they send you one that is good. If they mess up more than once they are known to throw stuff in as a way to say sorry. Just ask who you talk to one the phone. If they don't follow through then you know the persons name. Wait til Monday to see if you get an email back. Saturday is not a business day. You won't get an email back. I've been waiting two years for a return email. He sent that email on the 10th of December. They aren't going to reply. I called about a missing part on my Reaver, and when they sent me a replacement they gave me a reference number for the part being sent out (it started with a Z). I had no success with email - one phonecall, and I now have the replacement parts for the Reaver, free of charge and without any quibble. They are top dollar for Customer Service when you speak to a human.